2018 Fall Clean Sweep Success! Thanks Susan, Andrew, Marilyn and Chris for making 14th look so nice! This was our second Fall Clean Sweep in a row where the weather was absolutely perfect! We had 27 volunteers who picked up 10 bags of trash, filled up 6 bags of yard waste and 2 large yard waste cans full of leaves and weeds. Coffee and cocoa, donated by the The Ballard Market, kept us fueled as we picked up trash from NW 65th all the way to Leary Ave.
Linda, Peter, Sue, and Chris who helped load up cars, set up the event, work the event and then break it down. Whew! 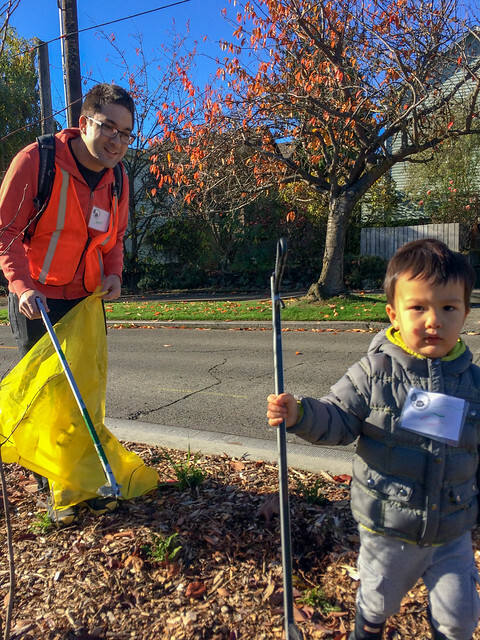 …and thank-you to Marilyn, Susan, Andrew, Steph, Ulysses, Leon, Erin, Mary Pat, Zack, Tom, Rose, Lesa, Rick, Lia, Rachel, Javier, and his son, Emnett, Indu, Banu, and more who showed up and made a difference by helping us clean up the neighborhood! Check out more pics in our Flickr album to see all the fun we had! 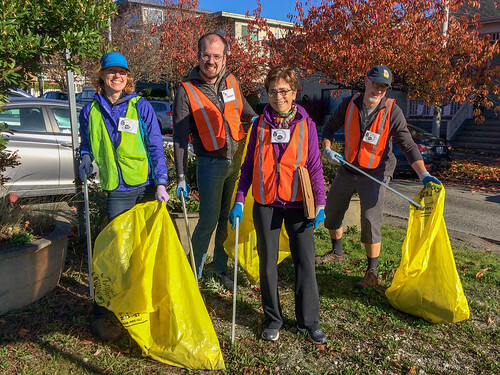 Thank-you neighbors and we’re looking forward to seeing you again in the spring for our next Clean Sweep event!